There’s a stunning moment in Bob Fosse’s film version of Cabaret (1972) in which the rise of fascism – and thus the death of freedom, or more specifically the dwarfing of the individual human spirit under the Hegelian juggernaut of the Nazis – is captured in the film’s closing frame in the reflection of a single Nazi uniform seated in the sleazy nightclub audience. Hungarian director Istvan Szabó’s film Hanussen, is riddled with such moments, a beautifully shot and brilliantly executed portrait of mounting doom as Germany succumbs to the eerie prophecies of Austro-Hungary’s most famous clairvoyant. Szabó emerged from the Hungarian New Wave of the 1960s with a series of deeply moral works which show the deep psychological wounds generated by his war-torn upbringing. One of Hanussen’s themes – the apolitical nature of the artist in the face of overwhelming political evil – is already evident in Mephisto (1981), the Academy Award winner for Best Foreign Film, in which German actor Klaus Maria Brandauer plays a stage performer who, against his better judgment, rises to great acclaim under the Nazis. 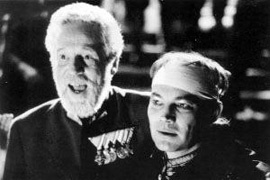 Szabó’s two follow-ups with Brandauer and cinematographer Lajos Koltai, Colonel Redl (1984), the story of a German officer court-martialled for his homosexuality, and Hanussen, were both also nominated for Academy Awards. Together these films are often regarded as his wartime trilogy. An earlier version of Hanussen from 1955 stars Klaus Kinski as a more manic wide-eyed prophet, Karl Schroeder, haunted by premonitions since he was shot in the head during WWI. Klaus Maria Brandauer, in an outstanding performance equal to his Mephisto, is a much more controlled and multi-layered Schroeder who, as Szabó’s idealised vision of the Individual, appears swamped by the tides of history, powerful forces that are within his sight but outside of his grasp. While recuperating in a military hospital, he comes under the influence of Jewish psychologist Dr Bettelheim (Erland Josephson), who guides him through the subtle art of hypnotism, and Captain Nowotny (Károly Eperjes), who teaches him how to market his bizarre gifts with a new name and image. With his new knowledge and seemingly magnetic power over men and women, Schroeder bursts forth into a post-war Europe in flux, both politically and spiritually; a continent consumed by pagan return-to-nature cults, the spiritist movement and Eastern mysticism, all mirrored in its nemesis Adolph Hitler’s almost pathological obsession with astrology and the occult. Reinvented as a suave turbaned mystic with the vaguely pan-European moniker Erik Jan Hanussen – a significant move at a time when national identity and racial purity were paramount – he quickly moves into influential circles of groups and individuals all vying for position in the post-war chaos, but declares his interests are the acquisition of knowledge, not political power. It is this very position which allows him to be both a pawn of the powered elites, and a dangerous figure to be feared by those screaming “fraud” and “charlatan”. He declares (in his customary non-partisan fashion) that the country is on the threshold of a new era: of order, and of the triumph of the will. Whoever achieves order, observes Hanussen, controls Germany. He predicts Hitler’s rise to power and the burning of the Reichstag with frightening accuracy, much to the horror of those with secrets who plot his chilling demise. Through the decadent parties and elaborately reconstructed “happenings” inside halls and theatres that harken back to Mephisto, Lajos Koltai’s photography (using diffused light) and Szabo’s expert eye for period detail perfectly capture the essence of the post-war zeitgeist. And despite the fatalism and inevitability of Hanussen’s predictions, his state of grace at the end gives the film a sense of hope for the plight of the individual, and that’s where Szabo’s unmuddied vision squarely rests. Even his recent work – Sunshine (1999) examining the tribulations of several generations of a Hungarian Jewish family, and Taking Sides (2003), featuring Stellan Skarsgard as Hitler’s favourite conductor – display a battle-scarred European artist trying to make order out of chaos, and gunning against the odds for the triumph of the human spirit. Andrew Leavold owns and manages Trash Video, the largest cult video rental store in Australia. As well as collecting obscure, forgotten, and unreleased films, he also curates the "Eat My Schlock" Bad Taste Short Film Festival, fronts a cowpunk caberet combo, co-runs the Turkeyneck Records label, churns out lurid posters and record covers for bands around the country, and is a filmmaker.